The rate of annual house price growth in Britain has fallen to its lowest level for nearly seven years as the property market in London and the South East suffers a significant reversal, official figures revealed today. 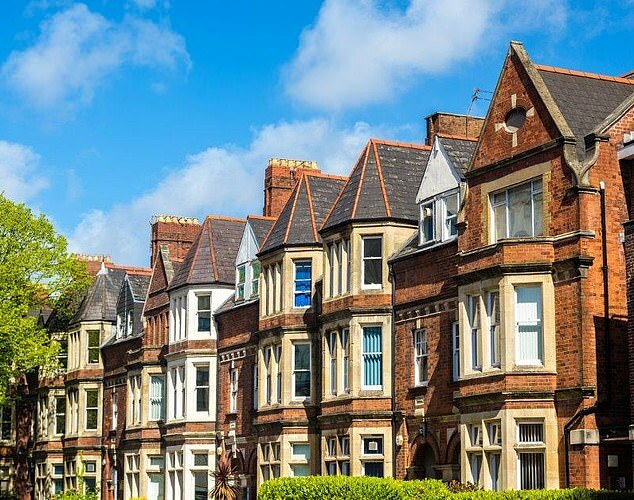 The average UK house price rose by 0.6 per cent in the year to February, down from an annual increase of 1.7 per cent in the previous month, according to data from the Office for National Statistics and the Land Registry. With the Brexit saga paralysing prospective home-buyers in the South East, the rate of annual property inflation has not been this low since September 2012. 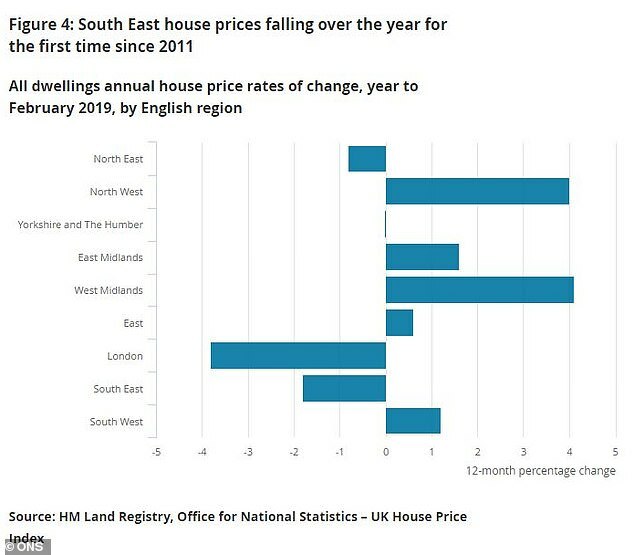 Falling fast: Average house prices in the south-east of England fell for the first time since 2011 in the year to February. The drop in house price inflation was down in large part to a downturn in the capital’s property market, where prices dropped a hefty 3.8 per cent in the year to February. 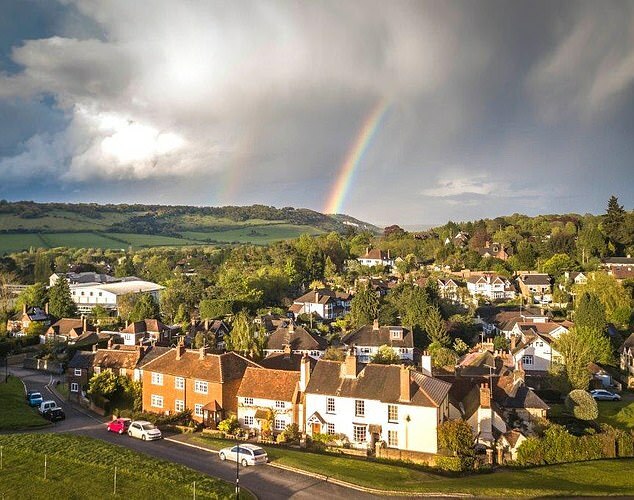 And property prices more widely in the south-east of England have fallen for the first time since 2011, dropping by 1.8 per cent in the same timespan. The fall in London house prices was the biggest since mid-2009, but the city remains the most expensive place to buy property with an average price of £460,000. 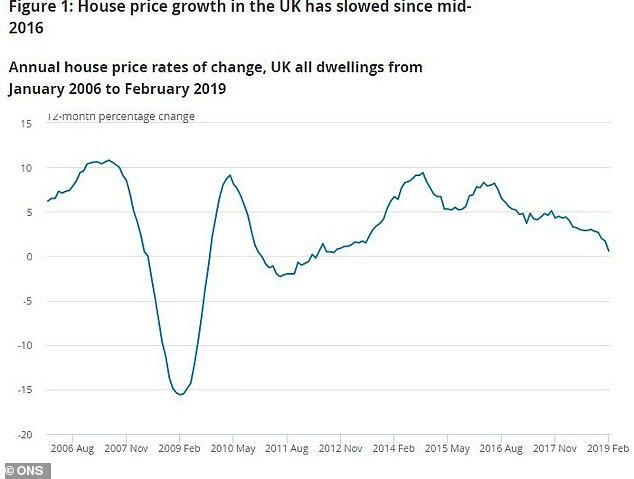 Mike Hardie, head of inflation at the ONS, said: ‘Annual house price growth has slowed to the lowest rate in close to seven years. The average UK house price was £226,000 in February, which is £1,000 higher than at the same point a year ago. The average house price in England increased by 0.4 per cent in the year to February, while in Scotland, prices fell by 0.2 per cent over the period, having risen by 2.4 per cent in the year to January. The average cost of a home in Scotland is now £146,000. House price growth was strongest in Wales in the year to February, with the average cost of a home rising 4.1 per cent to £160,000. In Northern Ireland, property prices rose by an average of 5.5 per cent to £137,000. While London house prices are falling over the year, the area remains the most expensive place to purchase a property, followed by the South East and the East of England, at £316,000 and £290,000 respectively. 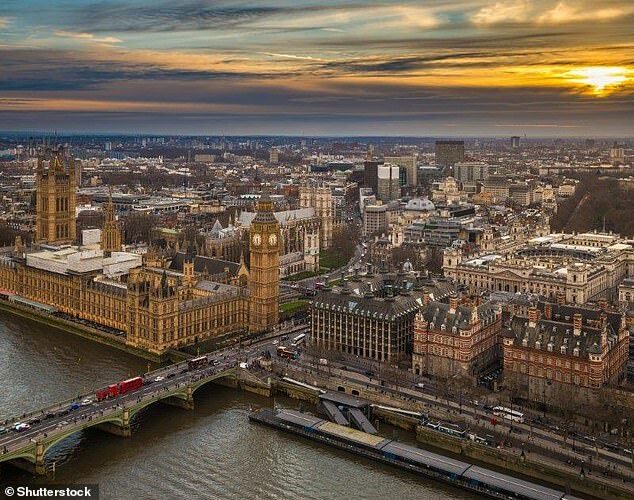 Jonathan Hopper, managing director of Garrington Property Finders, described the scale of house price falls in London as ‘breathtaking’. 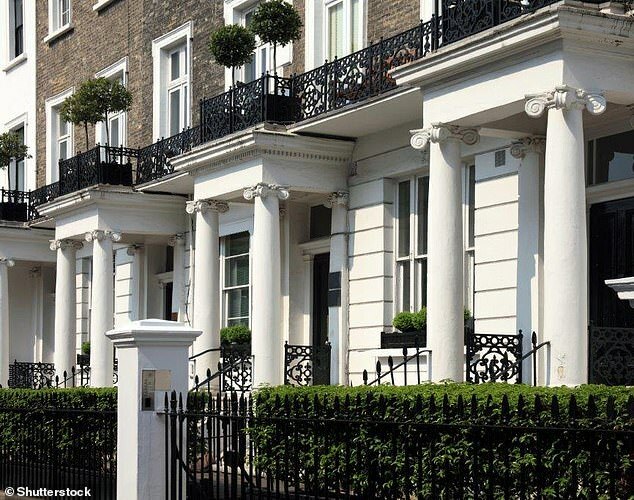 Lucy Pendleton, founder director of independent estate agents James Pendleton, said: ‘The undeniable correction now at hand in London is the adjustment many have been waiting for. ‘Falling prices in the capital are a sign that vendors have finally got the message. Jeremy Leaf, north London estate agent and a former RICS residential chairman, said: ‘These figures show the property market has finally caught up with what we have been seeing on the ground for some time – in other words, a lot of caution and “wait and see” until political uncertainty lifts a little at least. He added: ‘We suspect house prices will rise only 1% over the year and would not be at all surprised if they stagnate. ‘Consumers may well be particularly cautious about committing to buying a house, especially as house prices are relatively expensive relative to incomes. Today, the ONS also published its latest inflation figures. The figures revealed that inflation was stable at 1.9 per cent in March as a rise in fuel prices from February was offset by falls in food prices. The figures ease pressure on the Bank of England to raise interest rates. The Bank of England targets inflation, which is the rate of price increases, at 2 per cent.